Andrew Goudelock played 41 minutes last night for the Los Angeles Lakers and scored 20 points. Only Dwight Howard and fellow brother-in-obscurity Darius Morris scored more. 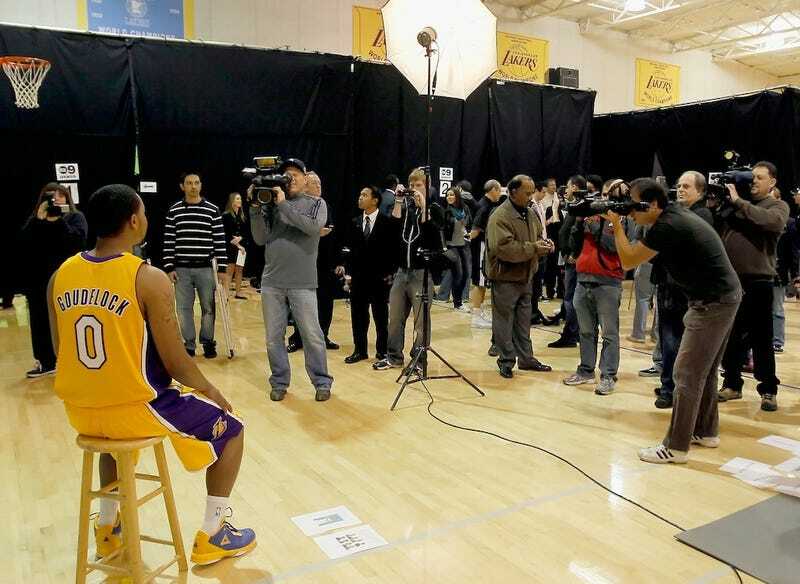 The Lakers drafted Goudelock in 2011 and he spent all of last year with the team, averaging 4.4 points in 40 games. He was the last player cut before the season this year and spent his time in the NBA's developmental league. He averaged 21.4 points and nearly six assists a game this year, earning MVP honors, which is kind of like having the most home runs in minor league history. The Lakers brought Goudelock back on April 14th, a depth move after Kobe's season-ending injury. Prior to last night he had one playoff appearance and played six minutes. Lakers assistant coach Chuck Person told him about an hour and a half before tipoff last night that he would be starting. Goudelock was refreshingly loose before the game and approached his night as a chance to play with house money. He's right, you know; the Lakers will likely be eliminated in two days.